Finnish folk metal superstars KORPIKLAANI have announced a co-headline tour in North America, with long time friends ENSIFERUM, with support coming from TROLLFEST. The tour is set to kick off May 6th in Los Angeles, CA and runs through May 29th in New York, NY. 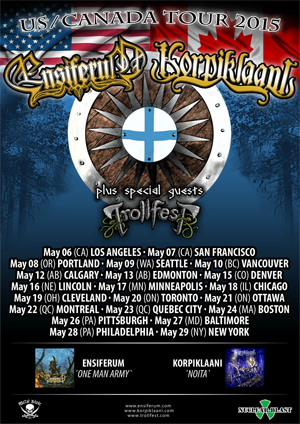 Additional dates will to be added to the end of April with TROLLFEST only. KORPIKLAANI are set to release their new album Noita on May 5th in North America via Nuclear Blast. Jan Yrlund, of Darkgrove Design, created the artwork. Yrlund has created all the KORPIKLAANI artwork in recent years and once again has come up with another masterpiece. In March, KORPIKLAANI will be headlining the Paganfest Extended Shows and will additionally play a run of European festival later this year.